UPPER WEST SIDE — Hundreds of locals gathered Tuesday to rail against the American Museum of Natural History's proposed expansion, threatening protests and lawsuits because the plan would "devastate" an adjacent park. At stake is a priceless public green space that the museum's proposed new Gilder Center for Science, Education and Innovation would diminish in size, residents argued. The small Theodore Roosevelt Park sits around the perimeter of the museum and is a vital part of the neighborhood, they said at the meeting, held at the Fourth Universalist Society on Central Park West. Organized by the nonprofit Defenders of Teddy Roosevelt Park Inc., which formed this summer, the town hall elicited a stream of ideas from residents bent on challenging the notion that the 218,000-square-foot new building was a "done deal." 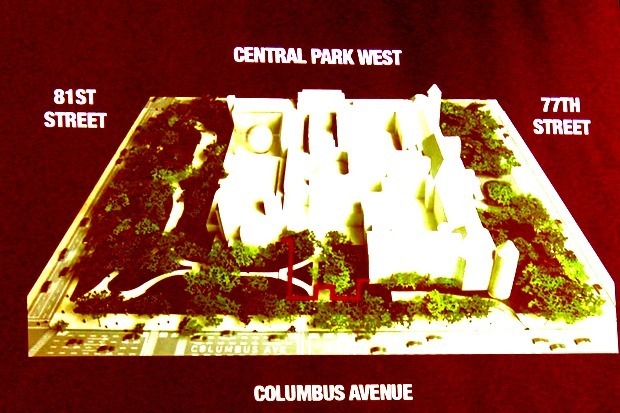 Because both the museum and the park are landmarked, the plans have to go through a lengthy public review process, starting with Community Board 7, then the Landmarks Preservation Commission and finally the Public Design Commission, explained Kate Wood, president of the preservation advocacy group Landmark West. If the expansion is approved, "10 majestic trees will be destroyed," and it will cause the "devastation of a tranquil community gathering spot," said Sig Gissler, the group's president, a sentiment echoed throughout the evening. One local resident was even moved to tears while reading a poem to a tree on his block that had fallen during last week's heavy wind. However, the atmosphere turned hostile and boos erupted when City Councilwoman Helen Rosenthal admitted that she supports the expansion in general. She's withholding comment on the specific plans until they're released, she said. Rosenthal promised residents she would work diligently to make sure the community process, in which people can weigh in on aspects of the design, is honored by the museum. Rosenthal wrote to the museum on Sept. 28 reiterating the importance of community feedback. "But if you think that by booing me today, that I’m going to take away this funding, that’s not true and that’s not possible," she said, referring to the $16 million in City Council funding she helped obtain for the expansion. Rosenthal said she was committed "as a proud representative of this community and New York City ... to make this museum be as great as it can be." Several residents began shouting at Rosenthal with frustration, and later attendees made the point that they can't trust that the public process alone will actually prevent the museum from eating up parkland. "You cannot count on public officials to help you in these matters. With our own councilmember supporting this, we’re dead in the water with the public officials," said resident Seth Aldwyn. Instead, Aldwyn suggested residents take to the streets to show the power of their conviction. "Can we have a public presence in the park before the weather turns bad — to surround the park by holding hands?" resident Cary Goodman suggested. "Does Mr. Gilder want to put $50 million into breaking that human chain?" he asked, referring to Richard Gilder, the new center's largest benefactor so far. The other two most popular ideas were to see if Gilder could be persuaded to withdraw his support unless the project was moved, as well as to see whether leaders in other boroughs would campaign for the museum to house the center in their communities. Now that a discussion among those opposing the expansion has begun and the Defenders can accept donations as an official nonprofit, the group will start to consider a lawsuit, Gissler said. "The legal option is on the table and it’s something that we’re looking at ... we’re going to move on to other tactics and efforts in the days ahead," he noted. Several museum staff members also attended the meeting, but did not speak. "We understand the concern for Theodore Roosevelt Park and we share it. We do not propose this project casually," museum spokesman Roberto Lebron said in a statement. "The Gilder Center for Science, Education and Innovation will help meet a critical need in our society for more and deeper science education both in the formal school context and for all visitors and society at large." The museum is currently considering different layout and design options with respect to how much parkland would be used, and its goal is "to minimize the impact on the surrounding park," the statement noted. As for moving the expansion to another borough or site, the museum rejected the idea outright. "[A] standalone, satellite building, apart from our 200 scientists, laboratories, collections, and other exhibitions halls, would not offer the kind of authentic scientific experience that makes on-site museum educational programs so potent," the statement said.